A real estate agent contacted me a few weeks ago about one of her clients who had a home that had been on the market for several months. The agent didn't feel like there was much that needed to be done, but I felt differently when I visited the home for the first time. The family that owned the home was lovely and their home reflected their interests throughout, even though they had purged their belongings several times. Each room had it's own matching set of furniture with the same wood tone and upholstery and all the pieces were pushed against the walls in an effort to make the rooms seem larger. There were religious paintings and specific sport team pictures, lots of traditional and somewhat-dated colors and too many different paint colors on the walls. 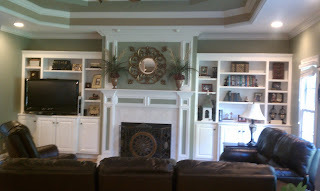 These are a few of the before & after pictures of the home. Sorry for the quality but lugging around a big camera from room to room as well as my tape measure, paint decks, and telephone just isn't going to happen! 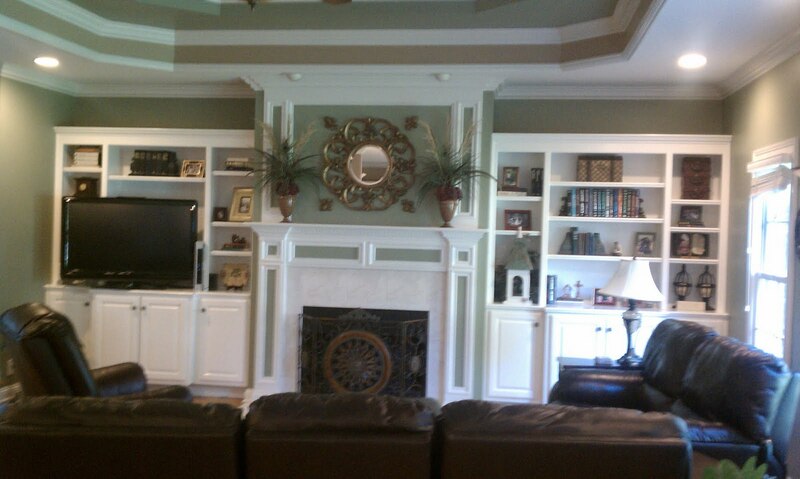 BEFORE Cluttered and busy family room built-ins. The green paint in this area made the built-ins look choppy and skinny even though in actuality, they fill the whole enormous wall. Also, all those little tchotchkes were too busy and didn't give the eye a place to rest. Clutter and green paint needed to go. Just too much going on. AFTER Simplified accessories and books covered in craft paper unify the decorative spaces. Those really large peacock-feather-and-red-somethings floral arrangements were removed from the mantle and this simple mirror added. Ahhhh...so nice and quiet. BEFORE Sponged, gold paint on the bottom half of the dining room. Must. Go. Away. There was also another scary overdone flower arrangement on the table in here. Had to go! AFTER Gold gone! Overly traditional florals gone! Master dresser was re-purposed as dining room storage. Simple accessories. No clutter. BEFORE Teen daughter's room. Homeowner was trying to show that this space could be used as an in-law suite, so that's why the recliner was next to the bed. Room didn't make sense this way so that granny-chair had to go. It ended up in the family room and it doesn't look "granny" in there at all! AFTER Furniture moved to maximize floor space and shots of pink added to make it look like it really is a fun room, as the original bedding suggests. 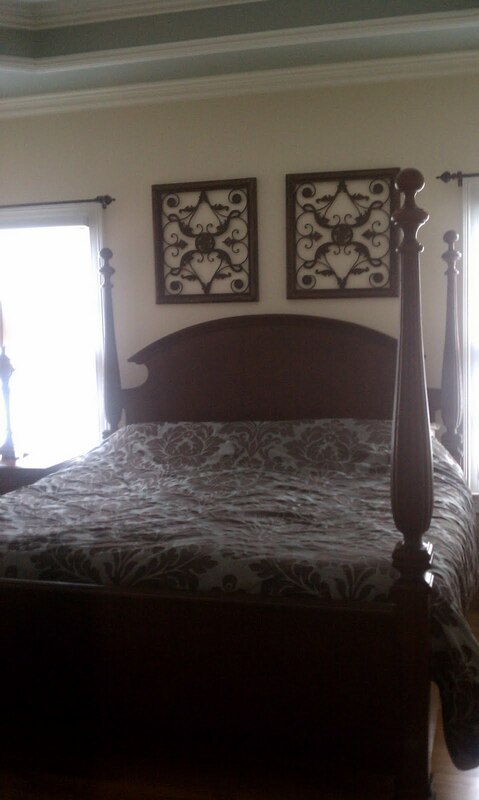 BEFORE Large bed overpowered the master bedroom. This had to go because it was so heavy. Bedding was heavy too, so that received a make-over as well. AFTER Now take a breath and relax. We are entering the serene, relaxation zone. Like they say on MTV's Cribs, "This is where all the magic happens!" Can you believe this is the same room? 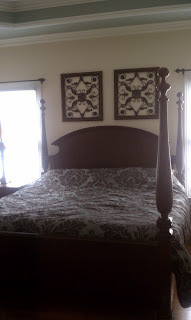 We made a headboard and added nail head trim. 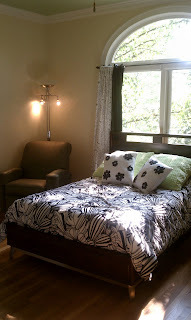 I made new curtain panels and raised them to the ceiling to make the windows look larger, I also made a couple new pillows. We added the settee so the room had a seating area, which it was lacking before. AFTER (master continued) Black shelving that was originally in one of the bonus rooms was used in here to fill the large empty wall and add a place to add decorative touches (without making new nail holes). We outfitted the shelving in neutral accessories with pops of white. AFTER I didn't get a good before picture of this bonus room but the game table was sitting in the middle of the room with no seating area except the bar table and bar stools, which were originally shoved over in the back corner of the room. We created a seating area by adding the couch and divided the spaces with the floor rug and bench ottoman. The bench ottoman was a great choice for this purpose because it is backless and can be used for seating on either side, whether a person seated there is watching television or watching an air hockey game. This was a fun project because the family is precious and a joy to work with. They were also willing to try just about anything because they had already purchased another home. We had to have this entire transformation completed in just a few days because the real estate agent scheduled an open house just days after our initial meeting. 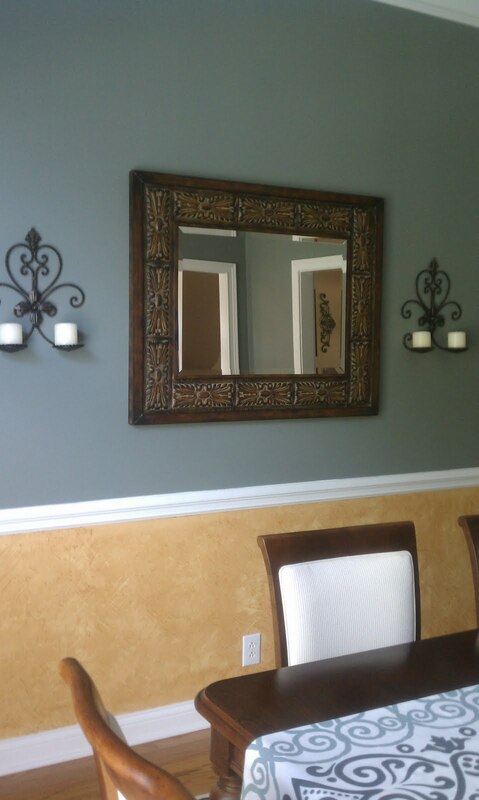 The very best part of this staging is that the house sold two weeks later! I have already met with the homeowner to discuss design for their new home and look forward to a long relationship with them. Well hello, world! Let me introduce myself. 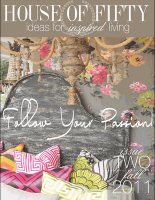 I am Kim Biggs and this is my little corner of the web where I'll share things that inspire me. In the past ten years I have gotten married, suffered through infertility, and been blessed with three babies in fifteen months. (insert record player screeching sound effect here) That, my friends, changed everything. I stayed home for the next three years. And I do mean that I literally stayed home. Leaving the house with three babies meant that our chances of someone having some sort of an explosion was guaranteed, physically or mentally (and usually both). So in the months and months that I spent at home with my babies, I used what I have always loved...decor, design and being inspired by beautiful things...to highlight my long days and give myself something to look forward to when the babies went to bed at night. During that time I discovered design blogs and I can't remember when or how I found the first blog that I stalked, but it belonged to Janell Bealls, Of www.IsabellaandMaxRooms.com and www.HouseofFifty.com I was so inspired by her idea of framing her kids' art that I couldn't wait until one of my babies could draw a sunshine so I could put it in a frame and showcase it as a masterpiece the way she did. I love that my first blog post falls on the day Janell's House of Fifty Fall Issue hits the web because I was honored to be asked to contribute an article. Janell advised me when we remodeled our home a coup,e years ago and encouraged me again and again to pursue my desire to start a business designing and decorating for clients. My babies all started school and I did start my own decorating business and I love it! So excited to join the blogging world and I hope you'll come back soon to see what exciting project I am giving my best shot. Be warned...I sometimes take myself too seriously, I can be a little goofy from time to time, and I can be just a dazzle sarcastic. But I love to divvy out great deals, show shortcuts I've learned and share the fabulocity that inspires me in my own home and the spaces my clients hire me to make over. I can't wait to hear from you too so show a girl some love and say hello! I'm Kim Biggs and this site reflects what inspires me, the design work I'm doing, and the projects I am attempting.